40 Super Hot Slot game is an enjoyable online video slot that is provided by EGT. If you’re familiar with EGT games then you’ll definitely love 40 Super Hot Slot as it is one of the highest demanded online games. 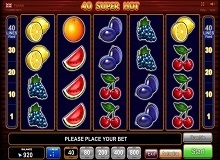 40 Super Hot Slot machine online offers a cool and enjoyable fruit themed game that is also very user-friendly, which makes it enjoyable and fun for everyone. The colorful fruits will make you love the game, you will be able to find grapes, melons, oranges, cherries, lemons, and plums, and you will also be able to find the scattered star but your favorite is going to be the lucky seven, which will allow you to go wild in the bonus games. 40 Super Hot casino slot online game has 5 reels and 40 fixed pay-lines, not only that but also more than one can payout at any time that will make your winning chances higher. 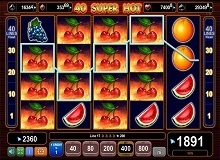 40 Super Hot Slot is a very user-friendly game. It doesn’t offer massive bonuses but your chances in winning are incredibly high, which makes it fun and entertaining with RTP 95.81%. Here are some tips that will help you know the it more. To start playing, you have to adjust your bet. Minimum bet starts with 1 and maximum in 800. The bet button also works as the start button. Once you click on the bet (start) button the reels will start spinning. If you want the same bet again you can either click on it or click on the “start” button on the right corner of the screen. At the bottom right of the game, you will be able to find the “Autoplay” button that will allow you to choose the bet and watch the reels spinning with no interruption. You can click on the same “Autoplay” button to stop the autoplay. Winning is very easy and everyone has a high chance of winning. All you need to do is get wild by getting the lucky seven, which has two main features. Getting the luck seven on its own will substitute for all other fruit symbols in order to create higher prizes. Getting multiple sevens to form their special winning line that can pay out up to 20,000 coins. The Scattered star in 40 Super Hot Slot can give you awards up to 400,000 coins when getting 5 stars. Getting 4 stars can give you awards up to 16,000 coins and getting 3 stars can give you up to 4,000 coins. Payouts in the game can reach up to 20,000 coins without any multipliers. Not only that but also each time you win, you can access the bonus rounds by pressing the “gamble” button that can multiply your winnings. The gamble feature is accessible every time you win, you will be able to find it in the right corner of the game. All you need to do in this bonus round is to guess the color of the card right whether black or red. When guessing the color correctly three times, your score will be double. If you guess the wrong color you will lose your score and you can leave the bonus game whenever you want without losing anything. Winning one of the four jackpots in 40 Super Hot Slot is very luckily to happen with no cheats at all, just choose 3 cards’ color correctly and you will be eligible to get a pleasant surprise. After winning in this bonus game and getting the color of the card correctly you will be able to play another jackpot bonus game that contains 12 cards face down and all you need to do is select the card with the left mouse click until you reveal 3 matching card symbols. Once you do that correctly you will be awarded the jackpot of 40 Super Hot Slot. 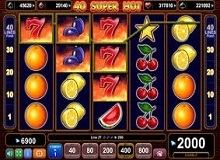 Playing 40 Super Hot Slot is so much fun with all the awards and bonus games it got. It makes winning so easy with no cheats at all. This new game from EGT has impressed everyone with all the colorful fruits and cool graphics and simple rules it makes you love the game even more. Any player can easily win from 40 Super Hot Slot and in the bonus game as well. You will be able to play 40 Super Hot Slot for real money or 40 Super Hot Slot free with virtual coins in many websites. The gamble feature that this online machine slot provides is so fun and not hard at all to guess. When guessing 3 cards correctly you can enjoy doubling your score and if you feel like you’re not going to guess it right you can simply leave this bonus round and get back to the reels. The lucky seven and the scattered star EGT provided makes it a lot easier and even more fun than all other online slots.